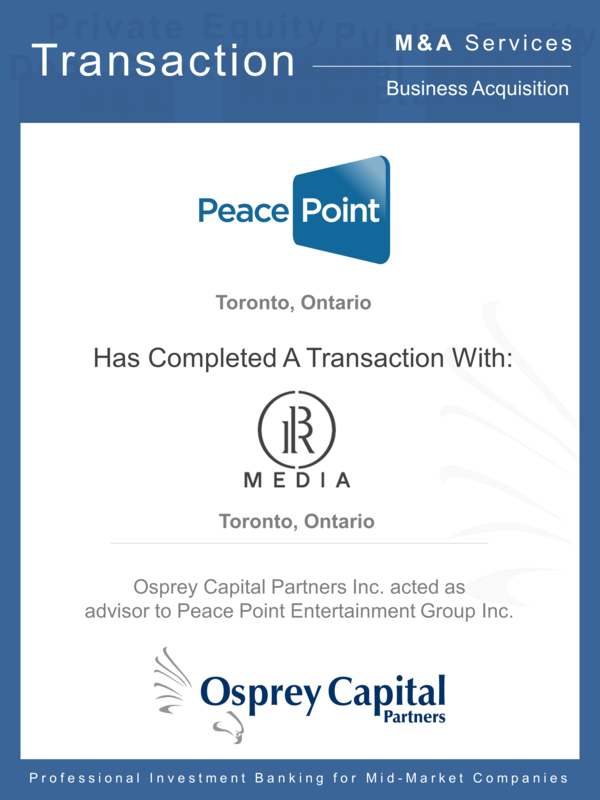 Osprey Capital Partners Inc. is pleased to announce that it has facilitated a transaction and partnership between television producer Peace Point Entertainment Group Inc., and Boat Rocker Media, producer of “Orphan Black”. The transaction was a divestiture of the factual and lifestyle catalogue of Peace Point’s distribution division, Peace Point Rights, to Boat Rocker Media’s distribution division, Boat Rocker Rights. The catalogue included a combination of Peace Point-produced content, and third-party acquired content consisting of factual and lifestyle series and specials for broadcast television. The agreement also included a multi-year, first look deal on new Peace Point output going forward. Peace Point Entertainment Group is a developer and producer of global content seen in 190 countries, and is led by its award-winning Founder, President and Executive Producer, Les Tomlin. Peace Point has been a prolific producer of factual, lifestyle, reality and documentary television since 2002. Peace Point has produced over 600 hours of content for multiple broadcasters, including Scripps Networks and Corus Entertainment, and for numerous countries, including the United States, United Kingdom and South Africa. 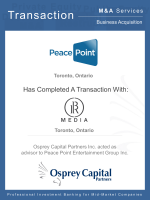 Peace Point engaged Osprey Capital to secure a strategic partner to both monetize its extensive distribution library, and maximize the value of Peace Point’s future content output. Osprey Capital Partners advised Peace Point in sourcing a new partner, Boat Rocker Media, and assisted in the negotiations and closing of the transaction, working closely with Peace Point’s legal advisors, Lewis Birnberg Hanet LLP.